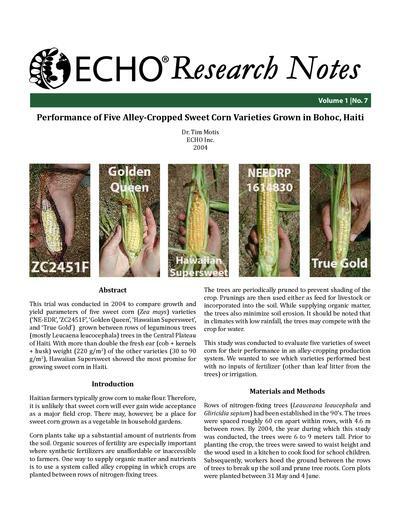 ECHO Research Notes are topic-specific publications about crops and agricultural practices important to those working in the tropics and subtropics. Our material is authored by ECHO staff (past and present) as well as outside writers, all with experience and knowledge of their subject. These documents are free for your use and will hopefully serve a valuable role in your working library of resources in agricultural development! In a tropical setting, growing seedlings can be difficult. A major factor of concern for nursery production is water logging (Zhu et al. 2007). During the rainy season, oversaturated soils can effectively suffocate root systems of a seedling by restricting flow of oxygen and other important minerals (Forcella et al. 2000). Nursery plants potted in dense soils are more prone to the negative effects of water logging. The incorporation of materials such as perlite and vermiculite into potting mixtures helps to combat soil compaction and facilitate drainage. However, both perlite and vermiculite can be restrictively expensive for growers, especially resource constrained growers, like many of those within our network. This trial was conducted in 2004 to compare growth and yield parameters of five sweet corn (Zea mays) varieties (‘NE-EDR’, ‘ZC2451F’, ‘Golden Queen’, ‘Hawaiian Supersweet’, and ‘True Gold’) grown between rows of leguminous trees (mostly Leucaena leucocephala) trees in the Central Plateau of Haiti. With more than double the fresh ear (cob + kernels + husk) weight (220 g/m2) of the other varieties (30 to 90 g/m2), Hawaiian Supersweet showed the most promise for growing sweet corn in Haiti. Tropical varieties of pumpkin, Cucurbita sp., vary widely in their production, fruit size and quality, and taste. 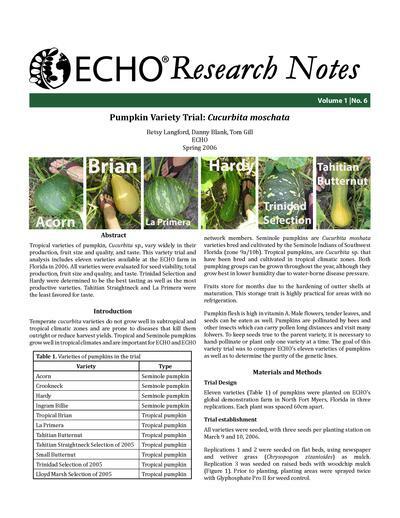 This variety trial and analysis includes eleven varieties available at the ECHO farm in Florida in 2006. All varieties were evaluated for seed viability, total production, fruit size and quality, and taste. Trinidad Selection and Hardy were determined to be the best tasting as well as the most productive varieties. Tahitian Straightneck and La Primera were the least favored for taste. 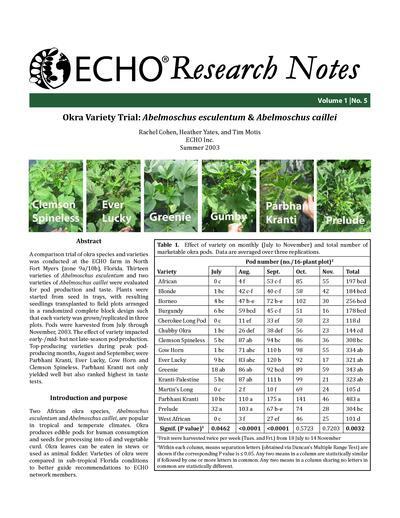 A comparison trial of okra species and varieties was conducted at the ECHO farm in North Fort Myers (zone 9a/10b), Florida. Thirteen varieties of Abelmoschus esculentum and two varieties of Abelmoschus caillei were evaluated for pod production and taste. Plants were started from seed in trays, with resulting seedlings transplanted to field plots arranged in a randomized complete block design such that each variety was grown/replicated in three plots. Pods were harvested from July through November, 2003. The effect of variety impacted early-/mid- but not late-season pod production.Top-producing varieties during peak pod-producing months, August and September, were Parbhani Kranti, Ever Lucky, Cow Horn and Clemson Spineless. Parbhani Kranti not only yielded well but also ranked highest in taste tests. Soil quality, also known as soil health, is the capacity of the soil to function – how well it fills the roles we need it to, whether in a natural or managed ecosystem. 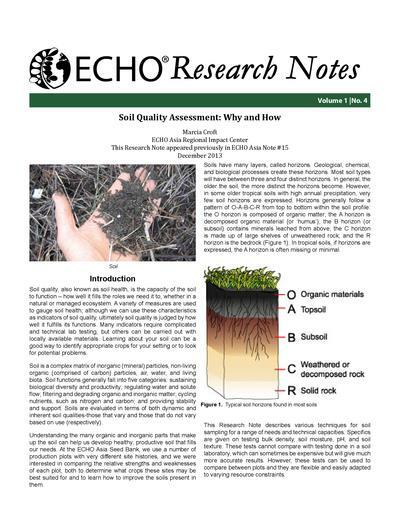 A variety of measures are used to gauge soil health; although we can use these characteristics as indicators of soil quality, ultimately soil quality is judged by how well it fulfills its functions. Many indicators require complicated and technical lab testing, but others can be carried out with locally available materials. Learning about your soil can be a good way to identify appropriate crops for your setting or to look for potential problems. Soil is a complex matrix of inorganic (mineral) particles, non-living organic (comprised of carbon) particles, air, water, and living biota. Soil functions generally fall into five categories: sustaining biological diversity and productivity; regulating water and solute flow; filtering and degrading organic and inorganic matter; cycling nutrients, such as nitrogen and carbon; and providing stability and support. Soils are evaluated in terms of both dynamic and inherent soil qualities-those that vary and those that do not vary based on use (respectively). Understanding the many organic and inorganic parts that make up the soil can help us develop healthy, productive soil that fills our needs. At the ECHO Asia Seed Bank, we use a number of production plots with very different site histories, and we were interested in comparing the relative strengths and weaknesses of each plot, both to determine what crops these sites may be best suited for and to learn how to improve the soils present in them. 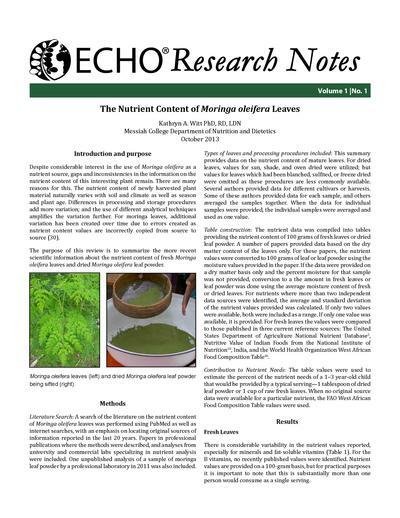 Despite considerable interest in the use of Moringa oleifera as a nutrient source, gaps and inconsistencies in the information on the nutrient content of this interesting plant remain. There are many reasons for this. The nutrient content of newly harvested plant material naturally varies with soil and climate as well as season and plant age. Differences in processing and storage procedures add more variation; and the use of different analytical techniques amplifies the variation further. 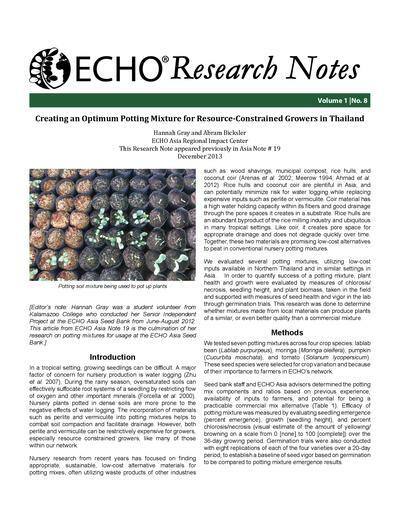 This study, conducted at ECHO during the Summer of 2011, was carried out to compare eggplant fruiting response to varying rates of a standard mineral fertilizer versus 6 month old compost with 25% cow manure and 75% plant matter (evenly split between woody and green, leafy material). The high rates were standard rates used on the ECHO Global Farm. 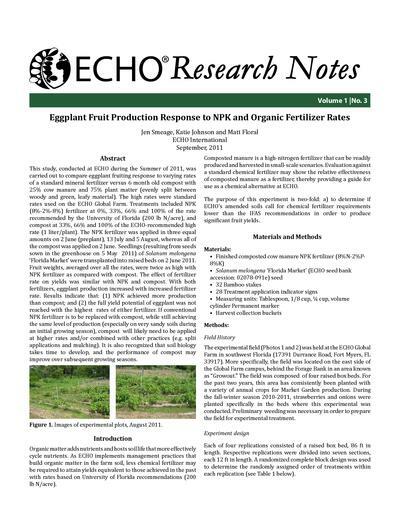 Treatments included NPK (8%-2%-8%) fertilizer at 0%, 33%, 66% and 100% of the rate recommended by the University of Florida (200 lb N/acre), and compost at 33%, 66% and 100% of the ECHO-recommended high rate (1 liter/plant). The NPK fertilizer was applied in three equal amounts on 2 June (preplant), 13 July and 5 August, whereas all of the compost was applied on 2 June. Seedlings (resulting from seeds sown in the greenhouse on 5 May 2011) of Solanum melongena ‘Florida Market’ were transplanted into raised beds on 2 June 2011. Fruit weights, averaged over all the rates, were twice as high with NPK fertilizer as compared with compost. The effect of fertilizer rate on yields was similar with NPK and compost. With both fertilizers, eggplant production increased with increased fertilizer rate. Results indicate that: (1) NPK achieved more production than compost; and (2) the full yield potential of eggplant was not reached with the highest rates of either fertilizer. If conventional NPK fertilizer is to be replaced with compost, while still achieving the same level of production (especially on very sandy soils during an initial growing season), compost will likely need to be applied at higher rates and/or combined with other practices (e.g. split applications and mulching). It is also recognized that soil biology takes time to develop, and the performance of compost may improve over subsequent growing seasons. Vermicompost contains significant numbers of biological organisms capable of suppressing plant diseases on leaf surfaces. 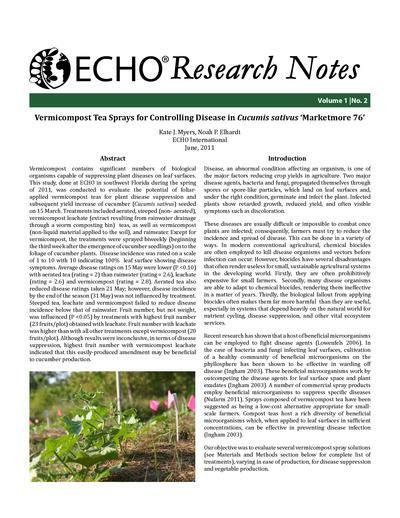 This study, done at ECHO in southwest Florida during the spring of 2011, was conducted to evaluate the potential of foliar-applied vermicompost teas for plant disease suppression and subsequent yield increase of cucumber (Cucumis sativus) seeded on 15 March. Treatments included aerated, steeped (non- aerated), vermicompost leachate (extract resulting from rainwater drainage through a worm composting bin) teas, as well as vermicompost (non-liquid material applied to the soil), and rainwater. Except for vermicompost, the treatments were sprayed biweekly (beginning the third week after the emergence of cucumber seedlings) on to the foliage of cucumber plants. Disease incidence was rated on a scale of 1 to 10 with 10 indicating 100% leaf surface showing disease symptoms. Average disease ratings on 15 May were lower (P <0.10) with aerated tea (rating = 2) than rainwater (rating = 2.6), leachate (rating = 2.6) and vermicompost (rating = 2.8). Aerated tea also reduced disease ratings taken 21 May; however, disease incidence by the end of the season (31 May) was not influenced by treatment. Steeped tea, leachate and vermicompost failed to reduce disease incidence below that of rainwater. Fruit number, but not weight, was influenced (P <0.05) by treatments with highest fruit number (23 fruits/plot) obtained with leachate. Fruit number with leachate was higher than with all other treatments except vermicompost (20 fruits/plot). Although results were inconclusive, in terms of disease suppression, highest fruit number with vermicompost leachate indicated that this easily-produced amendment may be beneficial to cucumber production.